At Torenko, We Only work with the BEST Companies - so YOU get the BEST Sales, Applications and Service Support. Our large organization covers the southern states of Texas, Oklahoma, Louisiana, Arkansas and Interior Mexico. In order to do this properly, we have the best staff in the U.S. - and the best partners in Mexico (Vectralis) to provide applications testin1 and installation services. Our mission is simple; to provide your with the best support staff and assembly solutions available. And we are successful because we work with only the most reliable products from the best companies across the world. Click here to get a listing of our entire sales staff.. For more on our Mexico sales and support group click here. 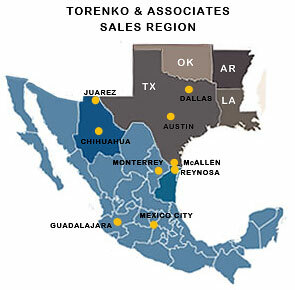 Click Here to for a Listing of Our Sales Engineers in Mexico and the U.S.
Dallas - Austin - McAllen - Guadalajara - Chihuahua.